Meet Cara Kellstrom, O.T., C.H.T. 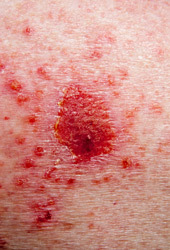 After a biopsy has been taken and the diagnosis confirmed by a dermatopathologist, treatment is required. Several effective methods are available to treat this tumor. Dr. Fender’s choice of therapy depends on the size, location and subtype of the basal cell carcinoma encountered. The patient’s age and general health are also taken into consideration. The more common treatment options include excisional surgery, electrosurgery, radiation therapy and Mohs surgery. Golden Plastic and Hand Surgery, Dr. Christopher Fender, is dedicated to providing you with a pleasant visit and results that you're proud to show off. Call Precision Plastic and Hand Surgery Golden Office Phone Number 303-954-8878 with any questions or to make an appointment.